Category Archives: ska brewing co.
Posted by Jeff Hammett in dogfish head brewing co., hamilton's tavern, ska brewing co. I actually haven’t seen a single episode of Brew Masters, the Discovery Channel show about Sam Calagione and Dogfish Head that focuses on their making of new and unique beers. Regardless of never seeing the show (which appears to have been cancelled after only a few episodes), I still fully appreciate this parody from the guys at Ska Brewing Company in Durango. To be fair I used to live in Durango, and some of these folks are friends of mine, but I think anyone that is remotely interested in craft beer and has a sense of humor will enjoy it. And to keep things local, keep an eye out for Ska’s President/Co-founder Dave Thibodeau wearing a Hamilton’s Tavern t-shirt in the first couple of scenes. Brew Minions, A Parody from David Thibodeau on Vimeo. Posted by Jeff Hammett in beer reviews, ska brewing co.
Ska Brewing Company is the biggest brewery in my former home of Durango, Colorado. Durango is home of four breweries and about 20,000 people, a pretty good ratio in my opinion. I’m a big fan of Ska so I brought back as much beer as I could when I visited earlier this month. 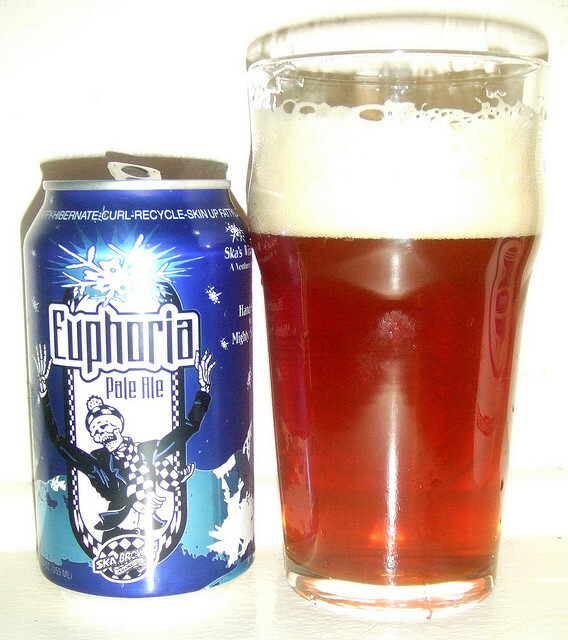 Euphoria is Ska’s winter seasonal which they team up with Venture Snowboards on. Every year they throw a kick off party up in Silverton, Colorado (above 9000 feet) in the dead of winter. Sadly I didn’t get to attend when I was living out there, but I hear it’s quite the party. Venture makes a Euphoria branded snowboard which is given away at the party. Euphoria pours a dark amber color (I didn’t take a picture when I was drinking it, but found this picture on Flickr, I’m not sure if there’s much more light in the photo or if my Euphoria is just darker than in the photo, but what I’m drinking is much darker) with a thin off white head that disappears pretty quickly. The citrus, specifically grapefruit as well as some sort of grainy malt smell stand out. The taste is well balanced between bready and grainy (with maybe a bit of toffee or carmel) malts and grapefruit like bitter hops. There isn’t nearly as much pine in Euphoria as there is in Ska’s IPA Modus Hoperandi (look for a little write up on it soon). Euphoria is just over 6% but easily drinkable. One of my favorite things about it is that it comes in a can (I’m a big fan of canned craft beer). Last year Ska released Dementia a barrel aged version of Euphoria to commemorate their 15th anniversary, unfortunately I wasn’t able to get any of this (If anyone out there reading has a bottle they want to trade email me using the contact form on the About page). Sadly Ska doesn’t distribute in California, so there’s nowhere to find this beer in San Diego, although Ska is usually at the Stone Brewing Co. Anniversary Festival in the summer. And they do distribute in Arizona, so if you find yourself out there, pick up a six pack. I don’t think you’ll be disappointed.